Be met on arrival and transferred to your ship before a Welcome Reception tonight. Head to Les Baux-de-Provence for a tour of the castle ruins, then visit an olive mill and farm in Saint Rémy de Provence. Alternatively, visit the ancient Roman relics of Arles. Both groups will have an afternoon at leisure to further explore, before re-boarding the ship to enjoy a delicious dinner. A guided tour of Avignon today takes you to the Palace of the Popes. In the afternoon, travel to the Pont du Gard, a spectacular 50-metre-high Roman aqueduct. Disembark in Viviers today and head out with the dogs in search of truffles then enjoy a delicious tasting. Re-board your ship later for dinner as you cruise towards Tournon and Tain-l’Hermitage. Choose your sightseeing in Tournon then later, cruise to Vienne and explore at your leisure. Explore the Beaujolais region on your chosen activity. Alight in Lyon and board a train to Paris. Enjoy a city tour, including a special lunch at the Eiffel Tower. Later, board your river ship for the second half of your voyage. Discover a different side of Paris during your selected sightseeing activity. 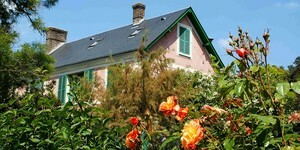 Travel to Giverny and visit Claude Monet’s house and gardens. Back on board, enjoy a Gala Dinner. 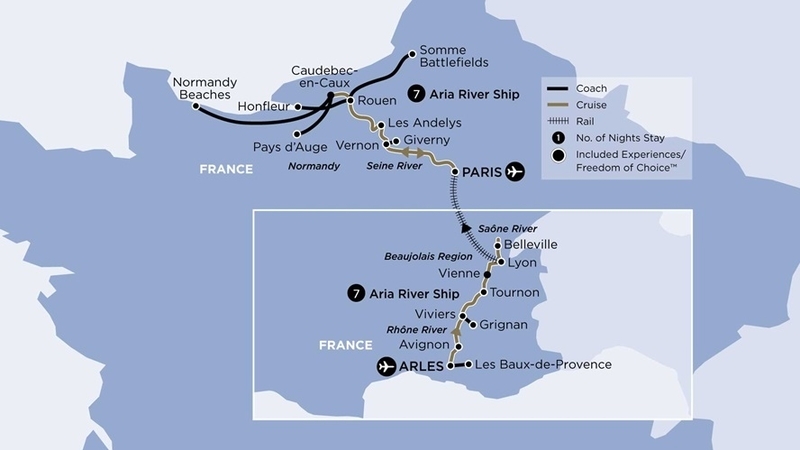 Perhaps join a full day trip in Normandy, tracing the events of D-Day - 6 June 1944. Alternatively, visit the beautiful Pays d’Auge region. Arrive in Caudebec-en-Caux and choose your sightseeing. Alight in Rouen and travel to the pretty port town of Honfleur for a tour. Dock in Les Andelys and choose your activity. Later, set sail for Paris. Choose your sightseeing in Paris. Travel by coach through the landscapes of northern France and into Belgium. Arrive in Ghent and enjoy a light lunch while cruising along the city’s canals. Continue to Amsterdam and transfer to your ship. After your first dinner on board, you may like to explore at your own pace. Perhaps embark on a canal cruise and admire the city from a glass-top boat as you glide past 17th-century homes, churches and 16th-century merchant houses. You may prefer to visit Zaanse Schans, a lovely village famous for its wooden windmills, traditional Dutch houses and specialty produce. Enjoy some time to explore and a tasting of the region’s cheeses before returning to your ship. 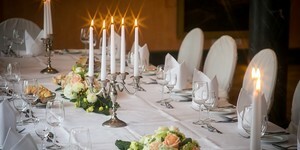 Later today after your sightseeing activity, set off along the Rhine River, enjoying a Gala Welcome Dinner. Later, rejoin your ship in Bonn and cruise to Andernach for an exclusive visit to Namedy Castle. This 14th-century residence is home to Princess Heide von Hohenzollern who has opened the doors of her castle just for you. Enjoy some free time to wander about the castle’s rooms, hidden nooks and grounds at your leisure, then savour a special dinner in the ballroom, accompanied by a classical piano recital. Enter Germany and cruise into Cologne, a city centred around the twin spires of its famous cathedral. Here, take a tour through the historic city centre, or sample a variety of local beers and snacks on a walking tour. Perhaps tour Siegfried’s Mechanical Musical Instrument Museum, home to the world’s most beautiful collection of fascinating automated musical instruments. Alternatively, take in sublime views over the stunning Rhine Valley as you travel in a gondola to the Niederwald Monument. Approach the most beautiful stretch of the Rhine River today, where crumbling ruins cling to rocky cliffs and rolling hillsides are marked with perfectly planted vineyards. 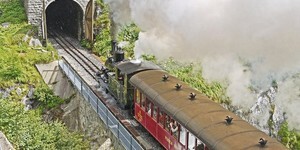 Dock in Rudesheim and take a trip aboard the Winzerexpress mini-train to the town centre. Later, enjoy a tantalising dinner on board. A local guide will take you on a special discovery of the town today. Stroll along the winding cobblestone lanes, explore quaint half-timbered shops, mingle with friendly residents and sample some delicious local fare along the way. The immense architectural beauty of Wurzburg is on show today as you stroll through the city to the Wurzburg Residence, an 18th-century palace that once belonged to the Prince-Bishops of Wurzburg. Inside, marvel at intricate tapestries, gilded stucco work and ceiling frescoes by Tiepolo. If you prefer, take a journey along the Romantic Road, one of Germany’s original holiday routes. Today, this beautiful thoroughfare takes you to the marvellous medieval town of Rothenburg where you’ll stop for a tour. After your sightseeing activity, return to your ship for dinner. Today, an exquisite private rail journey aboard the Majestic Imperator reveals the legacy of the once powerful Habsburg Empire as you travel from Passau to Linz. On board your privately chartered train, relax amid luxurious surrounds and savour refreshments while you wind your way through graceful alpine countryside. Disembark in Salzburg where a city tour includes some of the sights from the classic film, The Sound of Music. Re-board the Majestic Imperator and mingle with your fellow passengers as you’re entertained by live music en route to Linz. Enjoy a tour of Salzburg today. Disembark in Melk for a guided tour of Melk Abbey, one of the world’s most famous monastic sites. Or join a local guide for a tour of the town. 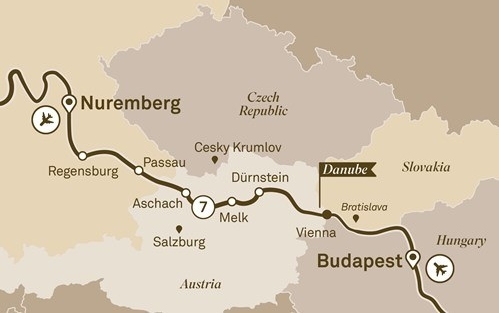 You may then choose to ride a bicycle along the banks of the Danube River from Melk to Durnstein, or rejoin your ship and cruise to Durnstein instead. Cruise through the Wachau Valley wine region today. On arrival in Durnstein, roam the village’s cobblestone lanes at your leisure and perhaps view the ruins of the castle where Richard the Lionheart, the King of England, was ­imprisoned in 1192. Tonight, your third Royal Signature Experience awaits at the princely family of Liechtenstein’s City Palace in the heart of Vienna. Attend an exclusive Cocktail Reception and a private concert featuring members of the Mozart Boys’ Choir, a full orchestra performing classical masterpieces by Mozart and Strauss, and an operatic recital. This will be an unforgettable evening you will treasure forever. Today arrive in Vienna, Austria’s capital and home to an array of striking architecture as well as a rich classical music culture and vibrant cafés. Take in many of the city’s most important landmarks during a tour along the Ringstrasse, Vienna’s famous ring boulevard officially opened by Emperor Franz Joseph I in 1865. You’ll also enjoy a guided walk to the glorious St Stephen’s Cathedral. Arrive in Budapest, where a city tour offers a thrilling discovery. See Buda Castle, the Royal Palace, Fisherman’s Bastion and more. Reflect upon the magnificent days that have just gone by as you sit down to the Captain’s Farewell Dinner. Afterwards, set off on a twilight cruise through the city and be enchanted by the lights of the Hungarian capital sparkling around you. Travel to Velke Bilovice for a light lunch in a Czech wine cellar. Arrive later in Prague. Steeped in centuries of colourful history, Prague boasts a wealth of enchanting monuments and stunning gothic and Renaissance architecture. Your sightseeing begins with a trip to World Heritage-listed Prague Castle. Visit Saint Vitus Cathedral then stroll over Charles Bridge on the way to the Old Town Square. Here, marvel at one of the city’s greatest treasures, the Astronomical Clock, which has been delighting visitors for more than 600 years. Tonight, a memorable Farewell Dinner awaits at the award-winning La Rotonde restaurant. Set in beautiful art deco style, dine in this exquisite setting as you farewell your new-found friends. Enjoy a Signature Experience in Prague, followed by the evening at leisure. 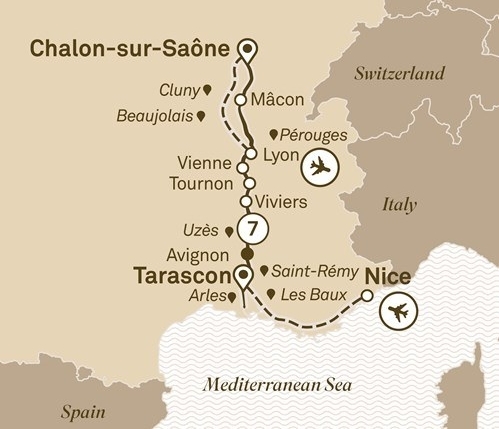 Board a luxurious Scenic Space-Ship in the former Roman town of Tarascon & cruise the Rhone to Chalon-sur-Saône. 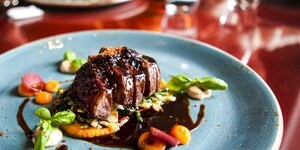 Enjoy the cuisines and delights of France. Transfer to the former Roman town of Tarascon, where you’ll be welcomed aboard your luxurious Scenic Space-Ship. Tonight you can look forward to a rousing welcome reception. Transfers from Nice or Marseille Airports are included. (Please schedule flights to arrive by midday). The town of Tarascon has a distinctly medieval character and an impressive castle. Back on board, perhaps join a culinary lesson in Scenic Culinaire during your cruise into beautiful Avignon. On arrival enjoy entertainment on board from one of the region’s best French chanson singers. Shop with a chef at the local market before cooking up a storm in Scenic Culinaire, or explore Avignon’s architectural wonder, the Pope’s Palace. Alternatively, take an excursion to Uzès and Pont du Gard, the impressive ancient Roman aqueduct nearby. This afternoon take some time to explore Avignon on your own. After the doors close to the general public at Avignon’s prestigious Pope’s Palace, you’ll be invited for an exclusive concert where virtuoso musicians perform Mozart, Bach and Vivaldi within this elegant 14th century palace. Enjoy a walking tour of Viviers and visit the imposing Cathedral of Viviers. Then, afternoon cruising to Tournon. Perhaps join a cooking class in Scenic Culinaire en route. Take a walking tour in Vienne and uncover the fascinating history of this quaint riverside town, once conquered by Julius Caesar. This afternoon join an on board masterclass in French cuisine in Scenic Culinaire, or simply relax and view the beautiful Rhône River vistas as you cruise to Lyon. Walk Lyon’s hidden traboules, and visit the Notre Dame Basilica, which offers fabulous views across the city. Alternatively, walk the cobblestone paths of yesteryear in the medieval hilltop town of Pérouges, or join a guided bike ride to Lyon’s Botanical Gardens and Zoo. Travel to the village of Oignt in the ‘Golden Stone’ region of Beaujolais, where you’ll enjoy a tasting of the region’s delicious wines. Alternatively, explore charming Cluny, built around the great Benedictine Abbey. Soak in the landscapes of the famous Burgundy region, straddling the shores of the Saône River, as you spend a leisurely afternoon cruising to Chalon-sur-Saône. 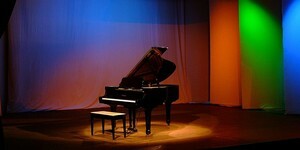 Freechoice: Make the most of a guided tour of this city including a piano concert. Alternatively, relax and unwind at the Thermal Baths and Spa, famous for their naturally heated springs and healing properties. Or, if you choose, brave the labyrinths of the Hospital in the Rock, a relic of WWII and the 1956 uprising. Breathe in the opulence and luxury of Palais Liechtenstein while enjoying a glass of fine Austrian Sekt. Then be enthralled by an enchanting private Viennese evening concert featuring the timeless music of Strauss and Mozart. Even in elegant Vienna, Palais Liechtenstein is one of the grandest of all venues, and you’ll have ample opportunity to explore it. Freechoice: Be guided through Melk’s magnificent 18th century Benedictine Abbey, originally built as a palace. Explore the opulence of this grand abbey including the awe inspiring library and abbey church. Alternatively, if you’re feeling more active, embark on an enjoyable guided bike ride along the river from Dürnstein to Melk – at your own pace, of course. As the day ends, you’ll get to take in the fine scenery at the breathtakingly beautiful Wachau Valley. 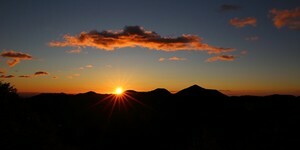 You’ll be in very fine company, and can expect a wonderful ending to a magnificent day. Of course, we don’t take all the credit for this one. It’s nature who’ll provide the view, we’re just bringing the drinks. Freechoice: Join your insightful local guide for an enjoyable walk around Regensburg where you’ll discover the old town, with its array of wealthy merchant houses, the Old Bridge and the Porta Praetoria – a reminder of Regensburg’s Roman heritage. Alternatively, hop on a local ferry and sail the Danube Gorge to view historic Weltenburg Abbey, set on the shore of the Danube River. Explore the abbey and sample beer from one of the oldest monastic breweries in the world. You could also take a leisurely cycle on your own with your Tailormade GPS device to the Walhalla Temple, a memorial modelled on the Parthenon in Athens and built at the request of King Ludwig I of Bavaria. Depart after a wonderful farewell breakfast. Nuremberg is the end of your cruise, but it will be the start of a lifetime of wonderful memories.